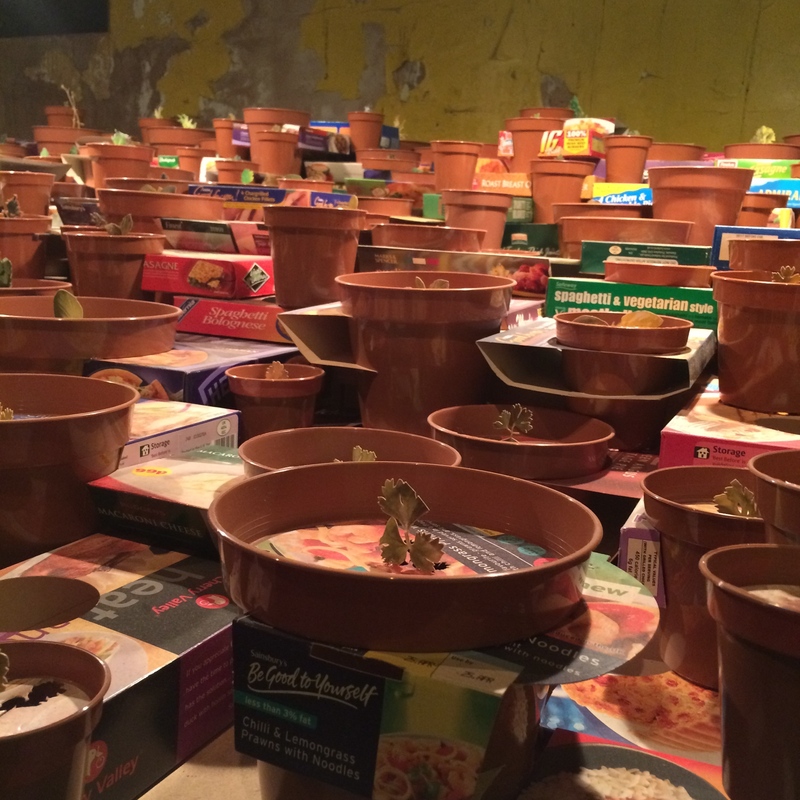 Banksy’s Dismaland has been the subject of much hype in the art world. It’s effectively an “anti-Disney” theme park in which themes of capitalism and ironic commentary on society run riot throughout a carefully curated selection of both gaudy and subtly clever artwork. This bleak theme park is perfectly situated in a derelict and abandoned seaside lido in Weston-Super-Mare. 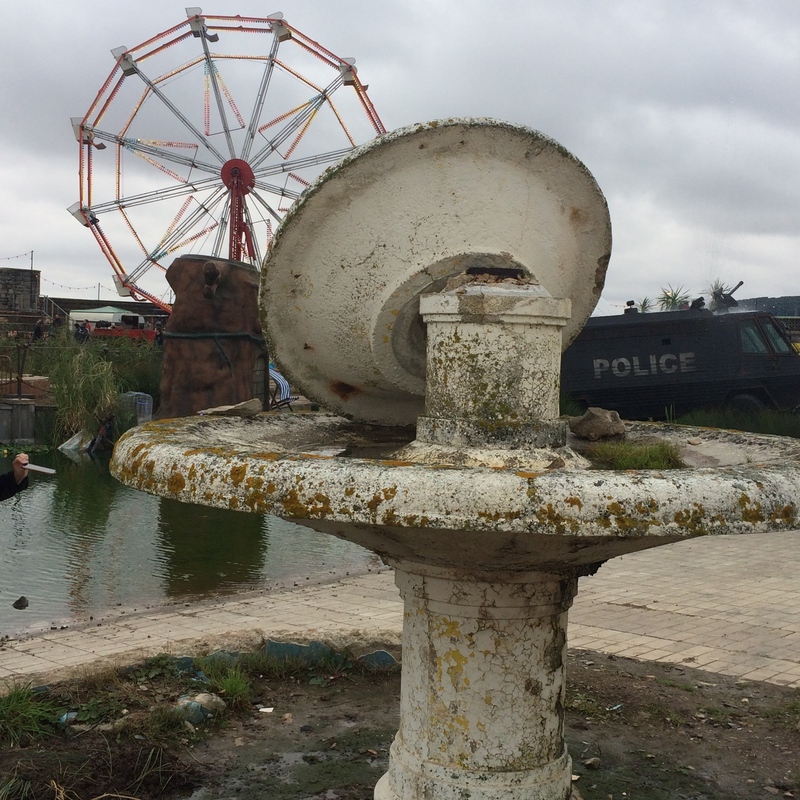 Broken pieces of the lido still liter the “fairgrounds,” giving Dismaland an effective and ruinous backdrop. It’s such a strange day out. There are some aspects of the park that are tremendous. People walk around holding balloons with “I am an imbecile” scrawled on them. Mad, frightening mascots chase people around the park and give the middle finger to people taking their pictures. David Shirgley has set up a brilliant fun fair game where you can win an anvil – except that you can’t win the anvil, ever. Deliberately moody staff (largely consisting of disillusioned youths – perfection) stumble around ignoring customers. Some drastically over-do it, but the girl handing out maps (or not handing out maps, as the case may be) by the entrance has everyone (bar those trying to obtain maps) in absolute stitches. There’s a genuinely amusing take on a merry-go-round, and the Jeffrey Archer Memorial Fire Pit, where you can “warm yourself around an authentic real open fire ceremonially lit each day by burning one of the famed local perjurer’s novels” is a subtle stroke of genius. The art galleries are also rather wonderful and rich in talent. 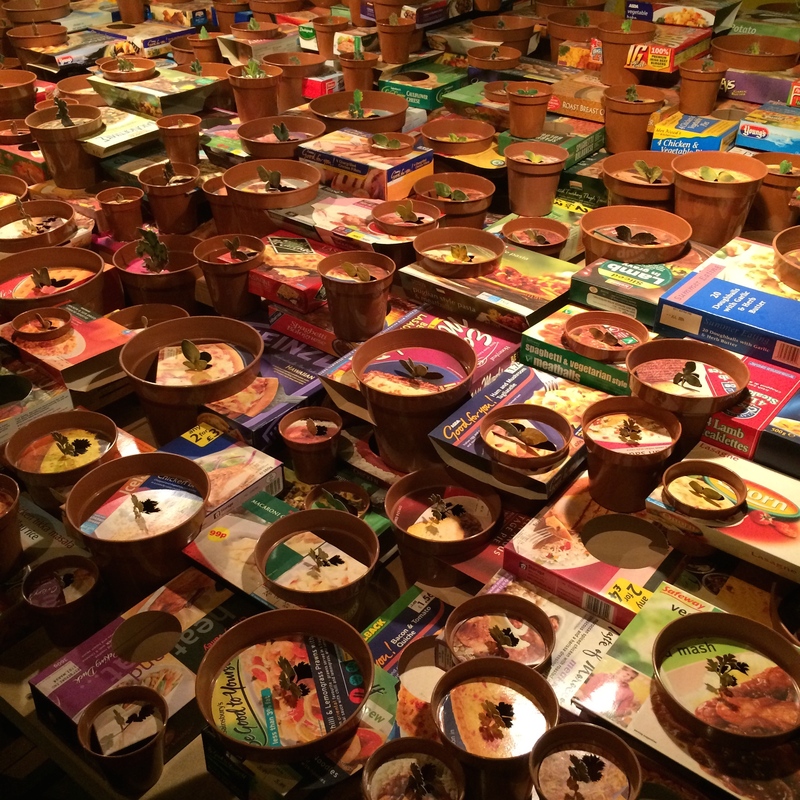 A work by Caroline McCarthy is a favourite of mine – she’s taken cardboard ready-meal boxes and delicately cut out and up righted the image of an herb on each one and placed the cut boxes into plant pots to create a fairly ominous but satisfyingly well-organized herb garden. The model village scene is equally wonderful; it’s a modern, gritty and apocalyptic scene of broken Britain at its finest. The dilapidated Princess castle is probably the main attraction of the park. Whilst queuing in the castle entrance, highlights of Disney’s Cinderella movie are shown on screen to watch before entering into a dark room to see the reality of being a princess. 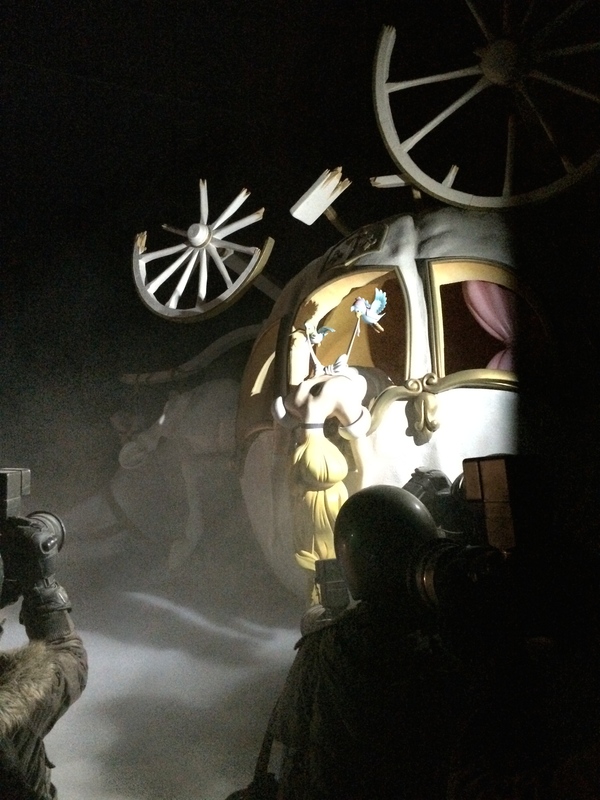 The scene that you are then confronted with is horrific – Cinderella’s carriage has overturned in a tunnel. Her lifeless body is hanging outside of the carriage in all its gaudy Disney splendour as – wait for it – modern paparazzi statues flash their camera lights on her over and over again. 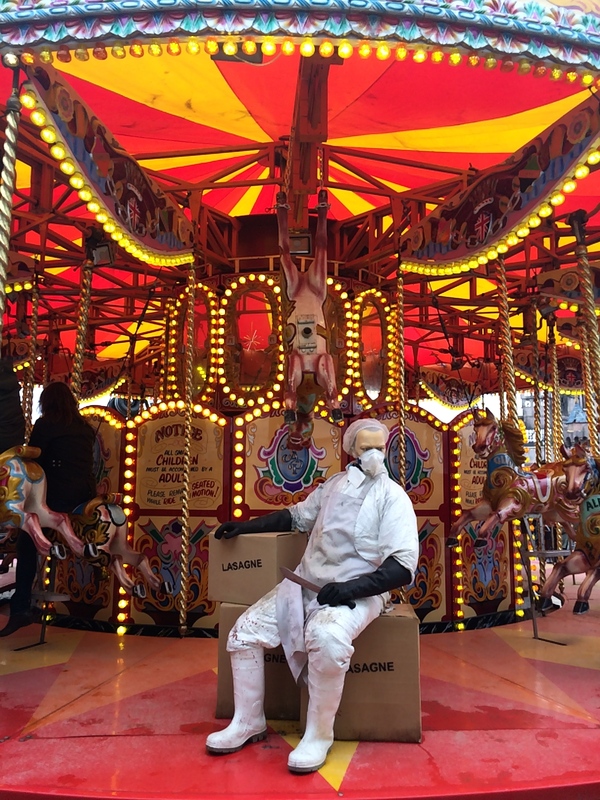 It’s really breathtaking, but it’s also at this captivating installation where my unease at Dismaland finds clarity and I understand why I’m so uncomfortable. I, like everyone else in the room, can’t help but whip out my camera phone and snap a picture of the dying Princess. That’s where the problem lies in Dismaland; I don’t know that you can visit it and not partake in the joke and be part of the commentary on society that Banksy is trying to make. 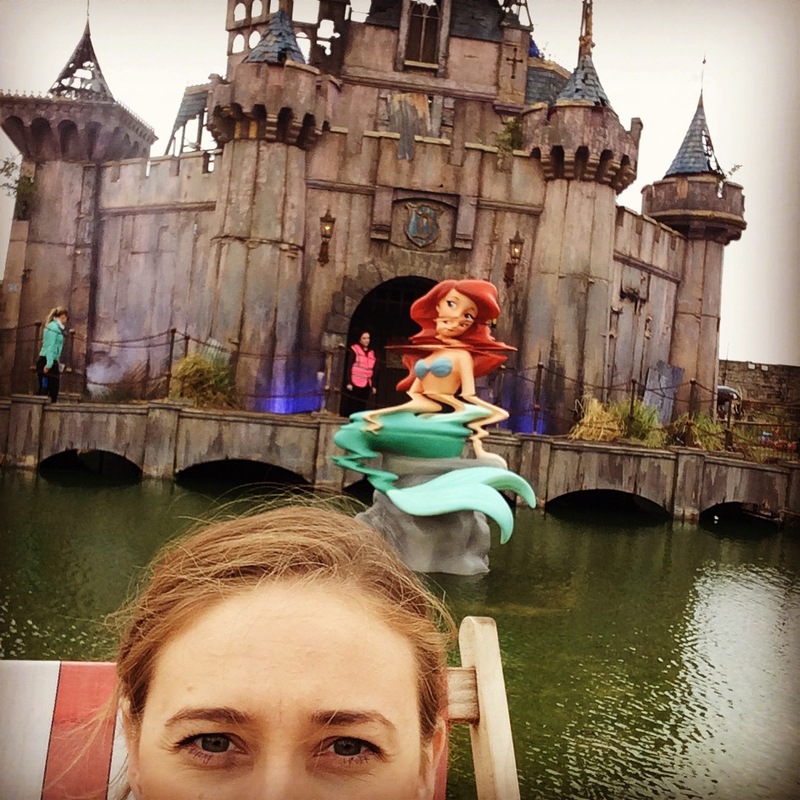 You’re not “in” on the joke at Dismaland; you’re part of the joke. You can’t be above what you’re witnessing – you’ve bought the tickets, queued up to view what is essentially a bleak visualization of the sad state of affairs of modern culture and you’ve queued and paid to see it. You want to come and laugh at the excess of consumerism, but I’m not sure you can – even by being there, you’re a participant and you’re part of the problem. This is driven home even harder by the really rather ingenious migrant boats section. The toy boats are in a pond and are stuffed to the brim with refugee figurines. There is also a toy gun boat with refugee bodies floating around it in the water. The pond is set up with remote controls advertising that you can pay a pound to operate either the migrant boats or the gun boats – which is cutting, sharp and poignant – but when you see children (of which there are many present in the park) gleefully steering the gun boat towards the migrant boat, the full horror of Banksy’s message is driven home. It’s uncomfortable viewing – which is precisely the point – and it’s not pleasant to be confronted with a reality that you’d rather not acknowledge. I left feeling rather bleak – and I must admit that’s exactly how you should leave Dismaland feeling. It’s certainly a success in the way Banksy designed it to be, even though it’s not a success in the way I perhaps would have wanted it to be. After all, for all the things I laughed at and loved, there were so many more which reminded me that I’m simply another nail in society’s coffin – and unfortunately, the queue for the bus with directions on how to fix the world was just too long for me to wait in. It’s clever, very clever and as a complete exhibition it has so much to say – just be warned, you’re not going to be entirely comfortable with what you hear. Tickets are sold on the day if you’re prepared to queue and a limited amount can be purchased online here, but you have to be quick. Even when arriving with tickets, be prepared to queue up to get in. Bring the barcode you get with the tickets! The page you printed initially may not have it, so ensure you have it saved on your phone or on paper when you get there. Weston-Super-Mare is not known for its 3G and you will not get in without the barcode. Bring money. Some of the attractions ask for money to partake in them. We weren’t sure if you seriously had to pay for some things, but it looked like maybe you did. There’s food inside and it’s actually not dismal at all. We were too afraid to eat anything cause you just never know how far the joke goes, do you, but the falafel smelled incredible. Good luck with hole number four in the mini-golf. Once you get in, go STRAIGHT into the Guerilla Bus and then head to the Pay Day loan section. We left those too late and the queues for them were too long (1hr 35mins for the Guerilla Bus!) by the end of our time, whereas other queues – like that for the castle and the (excellent) art exhibition – move much faster. Walk in like you don’t want a map. Trust me on this one. This entry was posted in Abandoned, Museum and tagged Art, Banksy, Dismaland, Exhibition. Bookmark the permalink.